Cloud is more than just a technology. It’s an approach to engineer a distinct environment that is designed to deliver IT and remotely provisioned scalable resources. Today, businesses-small, medium or large, all are moving their software and infrastructure to the cloud as cloud servers help them to maximize benefits like agility, scalability, cost savings and minimize risks like downtime, insecurity etc. Cloud delivers these benefits through its three deployment models –public cloud, private cloud and hybrid cloud.Each cloud model is a representative of a specified environment and is distinguished by the size, access, storage and ownership. The most crucial part of finding the right fit is the correct assessment of what will bring maximum benefits. So,along with the deeper understanding of cloud options, it is necessary to evaluate your needs deeply, analyze comparatively and align business needs with the right cloud type. Private Cloud: Cloud services are used by a single organization, so only the organization has access to its data and can manage it. Public Cloud:Cloud services are accessible via a network like internet and can be used by multiple clients. MS Azure, AWS are some of the examples of public cloud hosting. 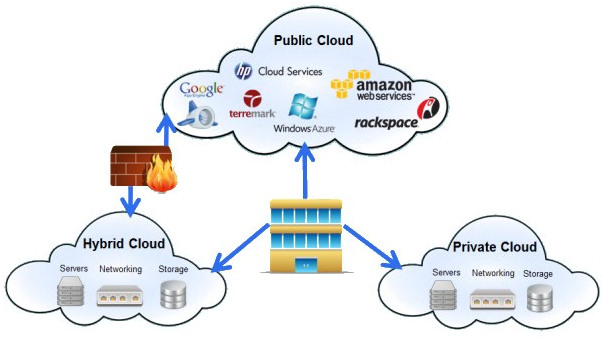 Hybrid Cloud:Cloud services are distributed among public and private clouds. Its users can use them as per their requirement i.e.private as well as public cloud services in day to day operations. Cloud environment Multi-Tenancy-Shared environment. Single tenancy-only for single use of an organization. Both single tenancy and multi –tenancy. When data is stored in the public cloud, it delivers multi- tenant environment meaningthe data from multiple organizations is stored in a shared environment whereas when data is stored in private cloud, it is kept private for the use of asingle organization. Data center location Anywhere – where the cloud service provider’s services are located. Inside the organization’s network. Inside the organization’s network for private cloud services as well as wherever service provider’s services are there for public cloud services. Resource sharing Server hardware, network and storage are shared by multiple users in the cloud. No sharing of resources. Hardware, storage and network are dedicated to the use of a single client or company. Very secure; integration options add an additional layer of security. Cloud storage Public cloud delivers storage as a service on a pay per use basis. Best for backups asa part of a disaster recovery plan as well as archiving email and static non-core application data. OneDrive is an example of public cloud storage. Private cloud delivers internal cloud storage that runs on a dedicated infrastructure in a data center. Hybrid cloud manages streamlined storage that uses both local and off-site resources and serves as a gateway between on premise and public cloud storage. Scalability Instant and unlimited. Sacrifices scalability but provides greater control and security. On demand unlimited resources. Pricing structure Prices charged on the usage basis. Comparatively expensive. High but delivers competitive advantage. Cloud Security Good, but depends on the security measures of the service provider. Most secure. Secure. Performance Low to medium. Very High. Very High. All the three cloud types hold important position in the IT industry and offer varied benefits that appeal to different organizations in various situations. Thus, be informed about different offers of different cloud deployment models when you decide to opt for cloud services as the perfect option for your business. If you have any doubt regarding this write-up, feel free to contact via comment section below. Previous: Previous post: Why Redmi 3S is the Best Budget Phone?